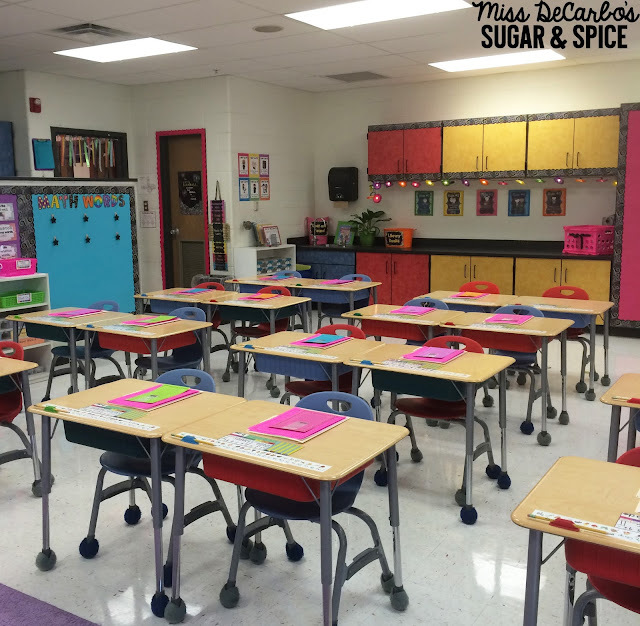 This post originally appeared on the blog Miss DeCarbo’s Sugar & Spice. During the last week of school, I collect all of my phonics phones from the kids. 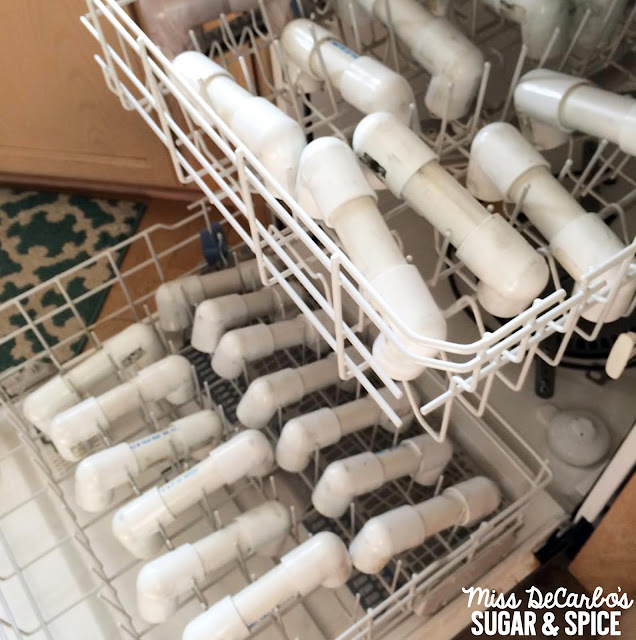 I take them home for the night and stick them in my dishwasher to clean and disinfect them. Then I seal them up in my storage container and pack them away for the fall. They are now clean, disinfected, and ready to be tossed into book bins come August. I have the kids clean their book bins out on the day before the last day of school. 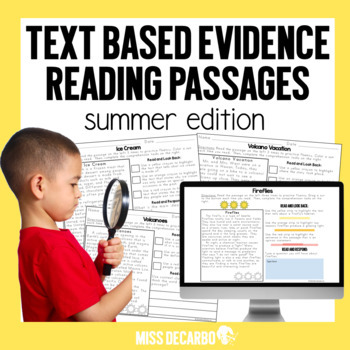 (It is so important to me that we are authentically reading and writing up until the very end of our school year together.) I stack them up and count out the word work books (empty books that we had lying around school from an old program) so that everything for Daily 5 in the fall is ready to go. All of my baskets of books get taken off of my bookshelves. I wipe down all of the bookshelves. 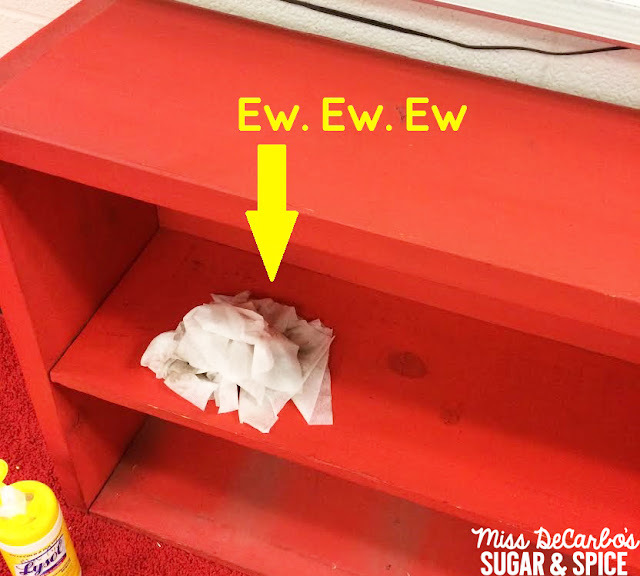 It’s amazing the amount of dust that collects on these shelves, even though we clean them throughout the year, too. Ewwwww! We use DRA assessments every fall in order to find each child’s independent and instructional reading level. Before I leave for the summer, I copy and refill my assessment box so that it is ready to go in September. It becomes one less thing I have to remember to do during the back to school rush. 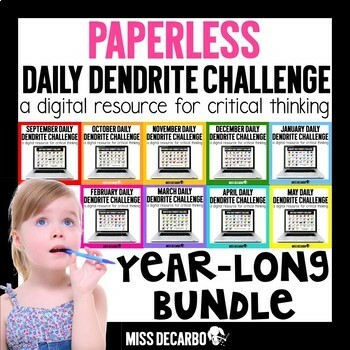 I use a routine for math that mirrors the Daily 5 routine. My students participate in math games with a partner, math games by themselves, computer games, tablet games, and small group math with the teacher. Our “math by myself” games consist of my Write On/Wipe Off Math Game centers. 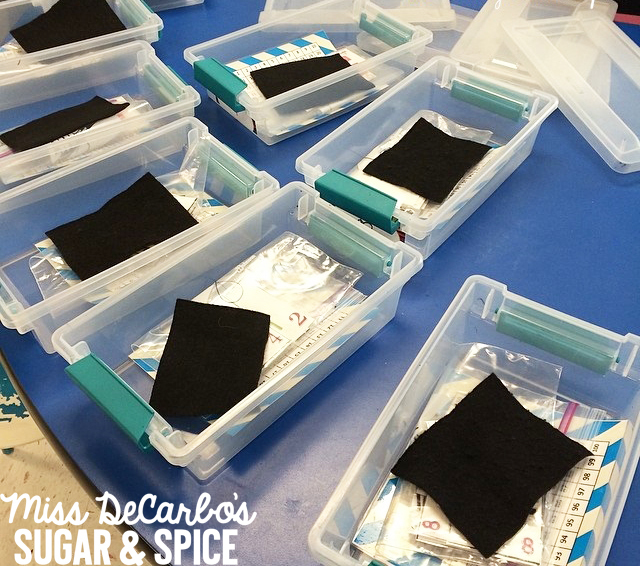 Before the end of the year, I pre-fill the tubs my students use for their independent games with a new felt piece for an eraser, a new dry erase marker, a hundreds chart, and the number cards that are used for all of the games. 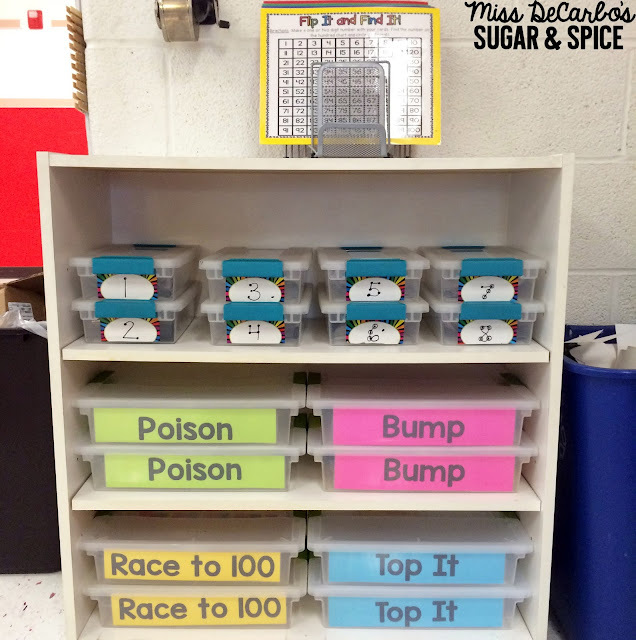 These bins are now ready to go when I begin to teach and launch my small group math games. 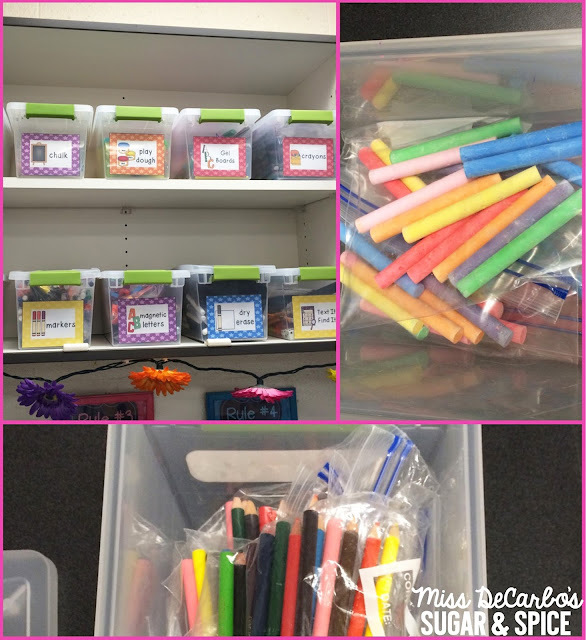 Below is a picture of the filled tubs my students will use for their math games. On the top of the bookshelf are the game boards they will use in the fall. These games change every month. 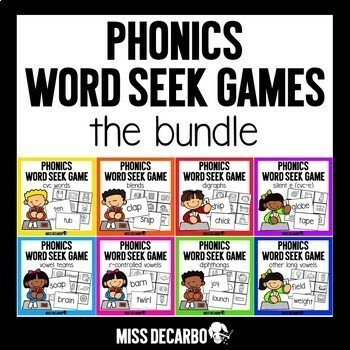 You can find my monthly Write On/Wipe Off Monthly Math Games for the entire school year by clicking HERE. We LOVE word work in my classroom! 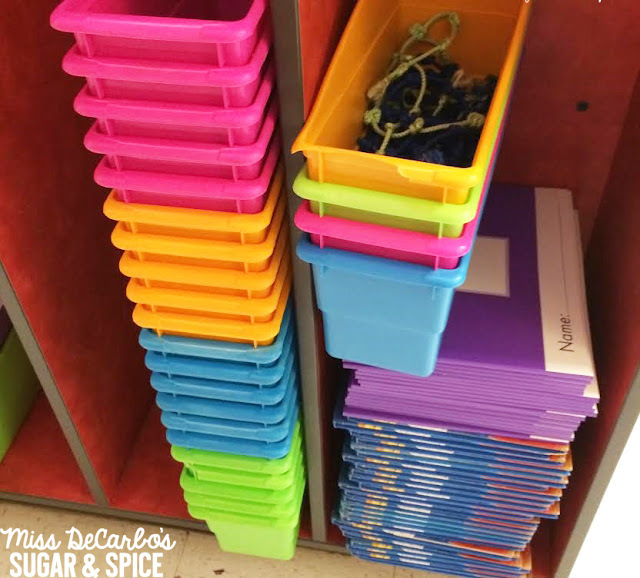 While it’s tempting to go out and buy brand new crayons, chalk, markers, and colored pencils for your word work bins at the beginning of the year, here is a little trick I use! 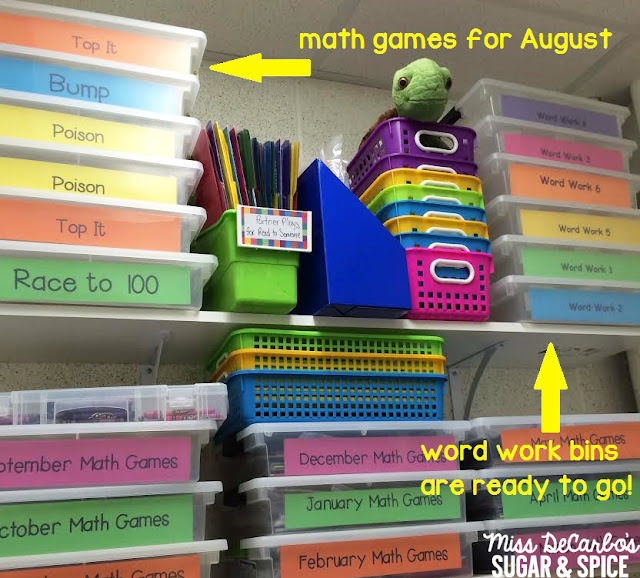 I start out our word work bins with the OLD supplies from the previous year. 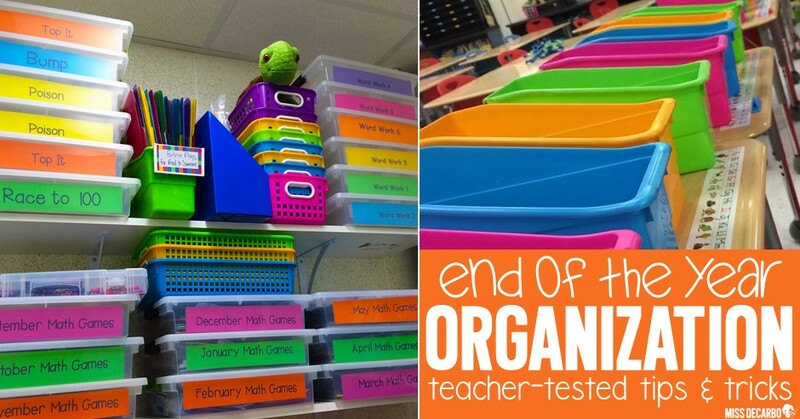 Then, when you replace these old supplies with NEW supplies around November and December, your kids will be SO EXCITED. 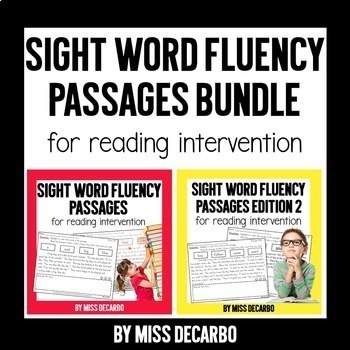 They will feel like they just “rediscovered” your word work bins and tubs all over again. 🙂 You can find my FREE word work supply labels in a blog post found here. This is what my classroom closet looks like during the last week of school! Everything gets piled inside and stashed away. On the left are my partner math games we play in August and September. (You can find out how to play Top It by clicking HERE to grab a free copy for your room!) I’ve filled these already with all of the manipulatives needed so that I can simply put the bins out in August and not waste my time getting them ready. On the right are my word work bins. 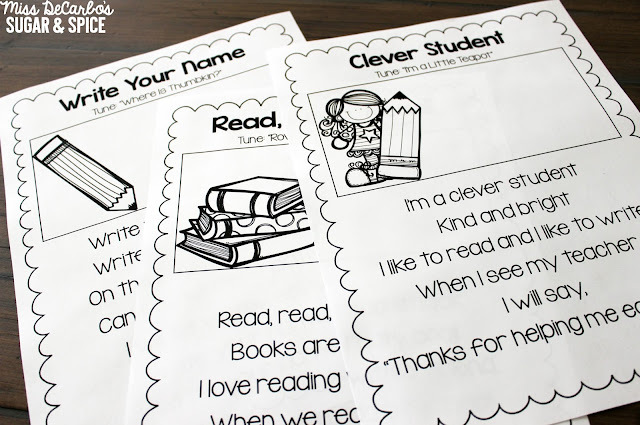 These are also filled with a simple list of sight words from kindergarten and a baggie of crayons. Their first word work task will be rainbow writing and reviewing their kindergarten words. 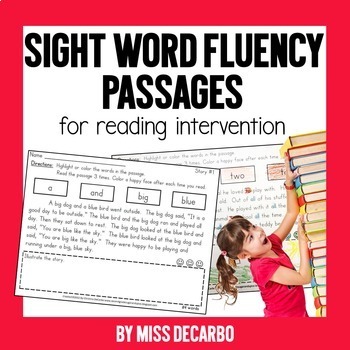 You can read all about how I manage word work by clicking HERE. 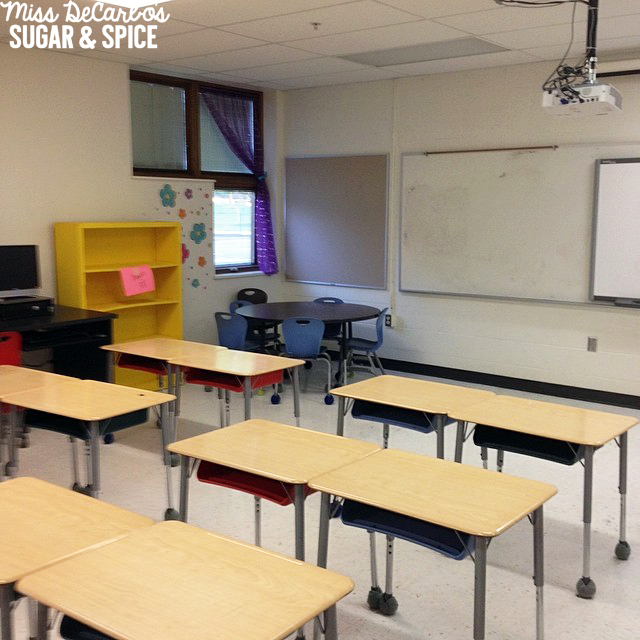 (Many teachers often ask me where I got the bins in the picture above. The bins are the large Sterlite Clip Bins from Target and the Dollar Store. I simply typed and taped the label inside of them using colored card stock. Can you tell I love to label everything?! 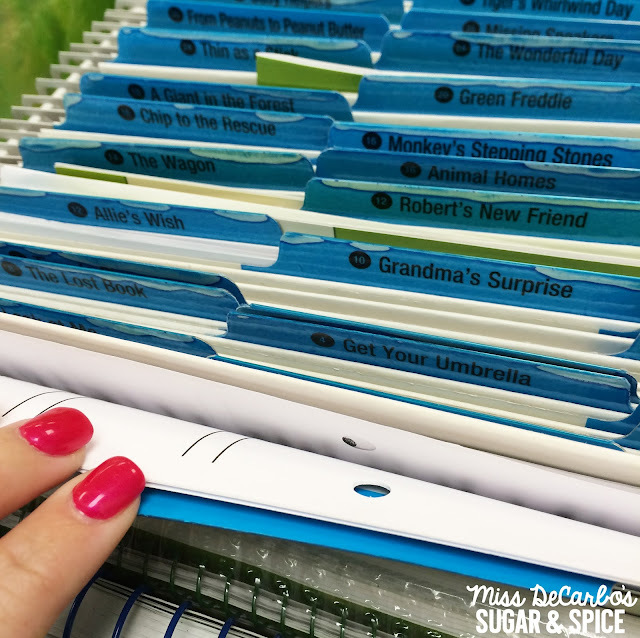 This next organizational idea is critical to my sanity in the fall! A month before school ends, I set out an empty box on the back counter of my classroom. Throughout the month, I prep, copy, and get things ready that I’m 100% sure I’ll need and use in the fall. Everything I’ve put inside of this box makes August about 120 times easier! 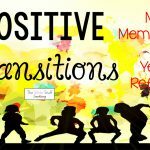 I know it seems crazy to think that you have the time to do this, but if you can manage to prep even a few things here and there throughout that last month of school, you’ll thank yourself in a few months! 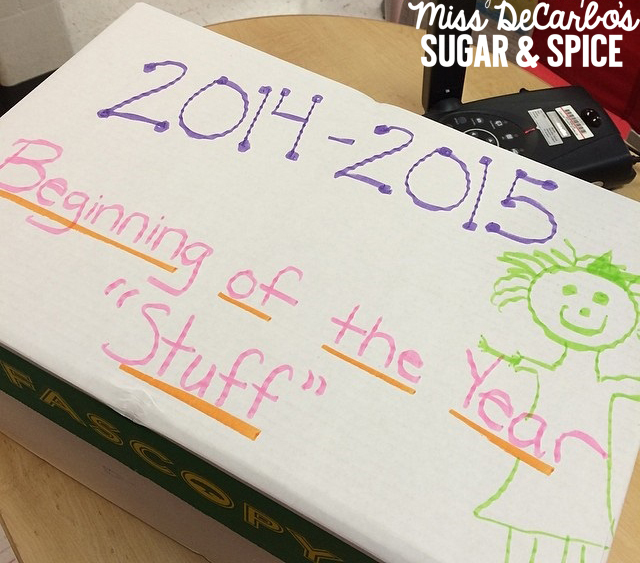 So the BIG question is: What is inside of my “Beginning of the Year Stuff” box? 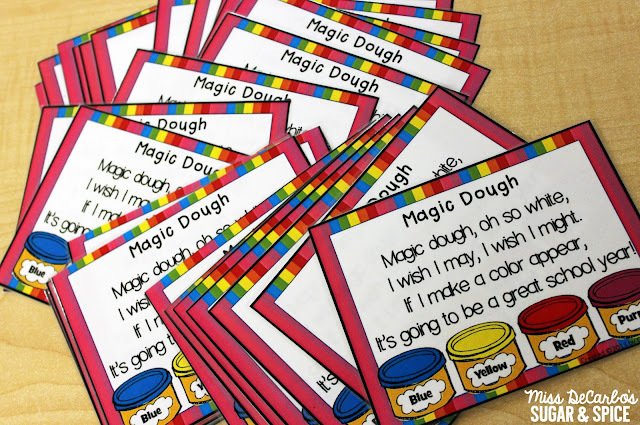 2) Goodies and activities we will use on the first day of school – The Magic Dough poem labels in the picture below get taped onto snack baggies for a special first day of school surprise that is ALWAYS a hit! 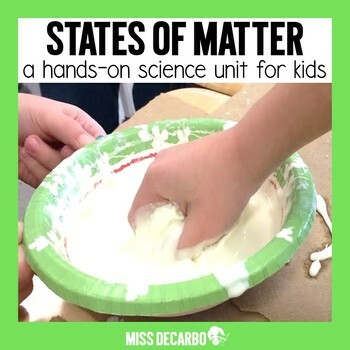 This adorable “experiment” is always so fun for my kiddos. 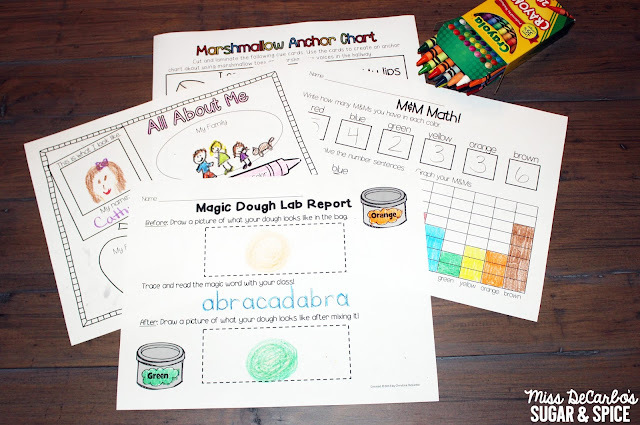 We complete an easy science lab report and say a magic word as we watch our playdough turn from white to fun, bright colors! 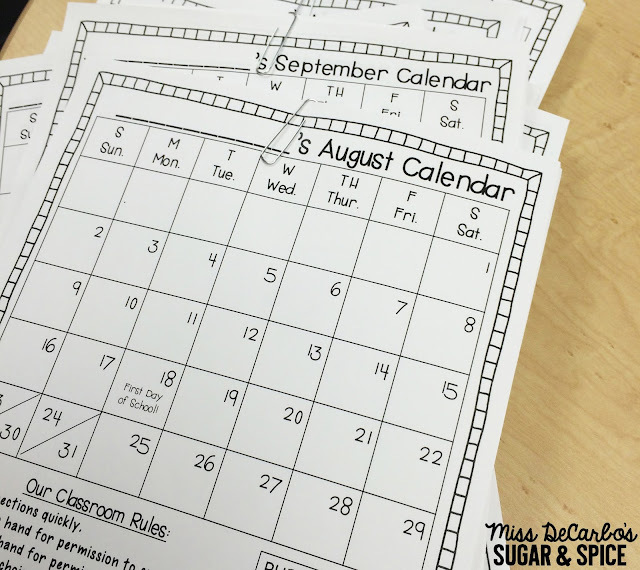 This activities comes from my First Week Fun pack for back to school! 4) We use poetry binders in my classroom every year, regardless of the grade level I teach. Every week, we add seasonal, monthly, and phonics-based poems to our binders in order to enhance our reading fluency. Before I leave for the summer, I make class copies of the first five poems we will add to our binders. 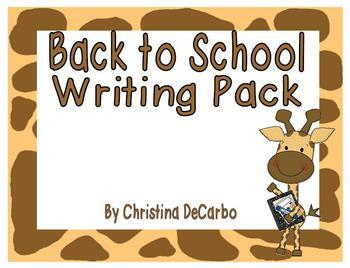 Our fun, monthly songs and poems have been bundled together for the entire school year. You can find them all in my Monthly Poems for the Whole Year! 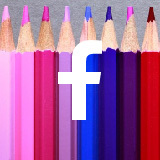 pack by clicking here. 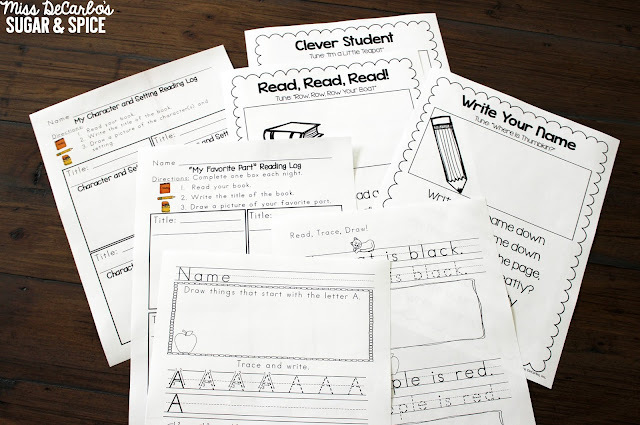 5) I also print out our first few Reading Logs and our Handwriting for Beginning Readers pages that we will start for morning work during those first couple weeks of school. *A bright neon note to parents that reminds them to sign and return all of the “important first week of school” papers for the office. 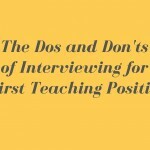 I clip this note to the pack of papers that goes home with kids on that first day of school. 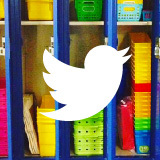 *Things for Meet the Teacher night, such as sign-up sheets, little slips of paper with our classroom Twitter account, and The Pinspired Teacher’s adorable cupcake donation tags found here. Since I now have plenty of work already prepared for the fall, I am officially ready for lots of relaxation and sunshine in our backyard! 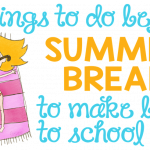 I hope everyone has a fabulous summer! 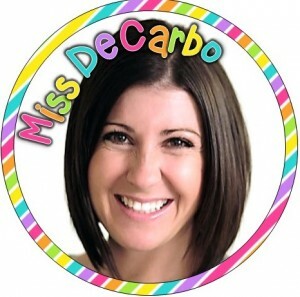 Christina DeCarbo (Miss DeCarbo) is a 1st grade teacher in Northeast Ohio. 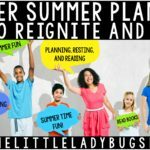 She provides professional development workshops and sessions for elementary educators at various state and national conferences. Christina holds a master’s degree in Elementary Literacy and enjoys creating new, engaging ways to motivate little readers and writers! 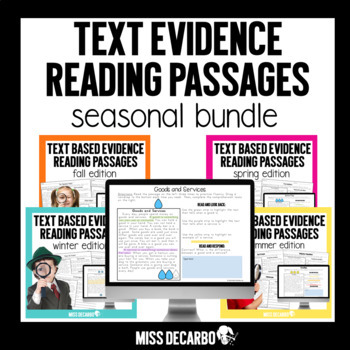 You can find her curriculum products in her TpT store, Miss DeCarbo. 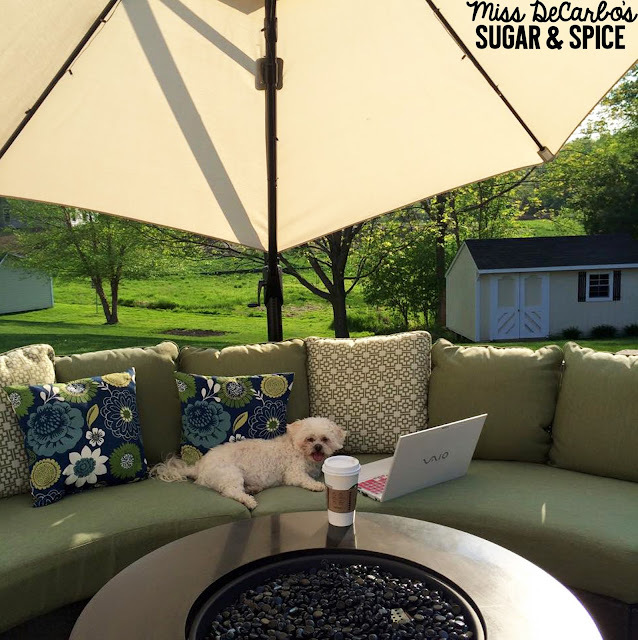 She is the author of the blog, Miss DeCarbo’s Sugar & Spice. 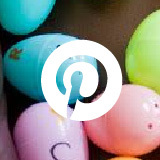 Christina loves to collaborate with educators through social media. 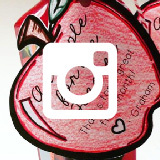 You can follow her on Instagram, Facebook, and Pinterest for tons of teacher tips, tricks, and ideas!